This new image of Centaurus A, released on May 31, 2012, combines ALMA and near-infrared observations of the massive elliptical radio galaxy. The ALMA observations, shown in a range of green, yellow and orange colors, reveal the position and motion of the clouds of gas in the galaxy. A recent photo of the colossal Centaurus A galaxy pierces through thick clouds of cosmic dust to reveal a clear view of its bright galactic center. The image was taken by the European Southern Observatory (ESO)'s Atacama Large Millimeter/submillimeter Array, or ALMA, the world's most complex collection of ground-based radio telescopes located in the Chilean Andes. To lift the veils of dust that obscure Centaurus A's central band, astronomers observed the galaxy in longer wavelengths of radiation than optical light. The photo, which was released on May 31, combines observations from ALMA at around one millimeter, and other views in near-infrared light from the SOFI instrument, which is attached to the ESO New Technology Telescope at the La Silla Observatory in Chile. The result is a clear look at the galaxy's brilliant center, where a supermassive black hole with a mass 100 million times heavier than the sun resides. Centaurus A is a sprawling elliptical galaxy that emits strong radio waves, and is the nearest and most prominent radio galaxy in the sky. The galaxy is located approximately 12 million light-years away from Earth in the southern constellation of Centaurus (The Centaur). Centaurus A has been an intriguing target for astronomers, who have observed the massive galaxy using different telescopes at a variety of wavelengths. In visible light, Centaurus A's characteristic dark central band obscures many features at its heart. This prominent lane of gas and dust is also a hotbed of young stars. In the new photo, measurements from ALMA appear as shades of green, yellow and orange. These views map the position and motion of Centaurus A's clouds of gas, and they are among the sharpest and most sensitive observations of these features ever made, ESO officials said. ALMA was used to detect signals emitted by molecules of carbon monoxide gas at wavelengths around 1.3 millimeters. The motion of the gas in the galaxy causes slight changes to this wavelength, which can be seen in the slight changes of color in the image. Gas moving toward us appears green, while the orange colors show gas moving away. Since gas to the left of the center is moving toward us, and gas to the right of the center is moving away, these clouds appear to be orbiting around the galaxy. 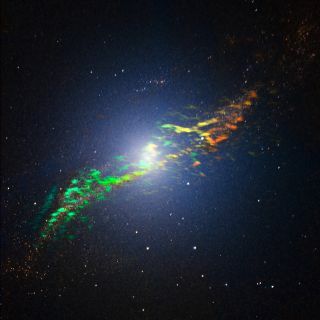 The image was created by overlaying ALMA's observations on a near-infrared image of Centaurus A from the New Technology Telescope's SOFI instrument. ALMA is a complex of 40-foot (12-meter) radio telescopes sitting at an elevation of 16,500 feet (5,000 meters) on the Chajnantor plateau in northern Chile. These individual antennas each pick up light in the millimeter/submillimeter range — about 1,000 times longer than visible-light wavelengths. ALMA's early science phase began in 2011 with 19 individual telescopes, but construction on the $1.3 billion project will be complete in 2013, when all 66 high-precision antennas will be fully operational, ESO officials said.